Venerable Athanasius of Syandemsky and Vologda was a disciple of Saint Alexander of Svir (Aug. 30). When Saint Alexander withdrew into solitude, Athanasius went too, and was present with him during an apparition of the Mother of God. 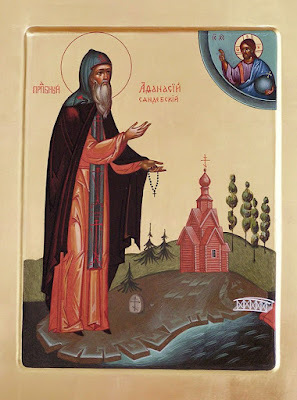 After the death of his mentor in 1533, he withdrew into a more remote area of the forest and established the Dormition hermitage in the forests of Karelia, not far from the city of Olonets, on an island of Lakes Syandem and Roschinsk. This came about when ten companions of Saint Alexander went out to him seeking his guidance. With the blessing of Archbishop Pimen, he erected a chapel in the wilderness in the name of the Life-Giving Trinity along with eight cells. The slander and pettiness of the local inhabitants compelled Saint Athanasius to move back to the Svir Monastery, where they chose him as abbot. It was probably at this time that he was ordained a priest. 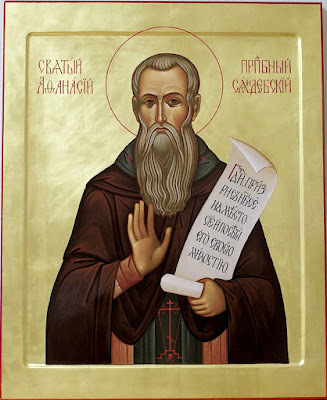 Later returning to the Dormition hermitage, Saint Athanasius was given permission from Archbishop Alexander of Novgorod to build a monastery at the site of his hermitage. He died in solitude on a nearby island in about the year 1550 in great old age, and was buried on one of the promontories of Roschinsk island. Afterwards, a church was built over his grave, named for Saints Athanasius and Cyril of Alexandria. The invasion of the Lithuanians and the Swedes at the beginning of the seventeenth century destroyed all written evidence of the time. Before this unfortunate event, the monastery flourished. With the onslaught of the enemies, the elders, in order to save some church objects and bells, lowered everything into the lake, at the bottom of which they remained forever. In the eighteenth century the monastery burned to the ground, and the Church of Saints Athanasius and Cyril of Alexandria was rebuilt. The incorrupt relics of the Saint were also uncovered after the fire and placed in this rebuilt church. 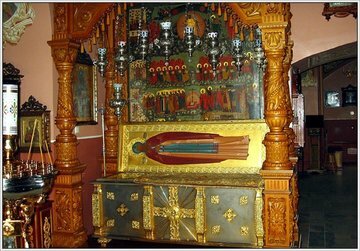 For several days the holy relics remained on the earth's surface, and then on May 2 they were buried in the former tomb.